What’s scarier than the pint-sized vampires, mummies and ghosts who will roam the streets this Halloween? The toxic chemicals that can be found in many Halloween products on store shelves. Don’t get tricked into buying them! 1. Avoid cheap makeup, especially face paint. Cosmetics on store shelves don’t require FDA approval and can contain some pretty terrifying ingredients. In tests for its recent report Pretty Scary 2, the Campaign for Safe Cosmetics found lead, cadmium and formaldehyde in face paint and other makeup marketed to kids. They also found volatile organic compounds (VOCs) in kids’ lip balms, nail products and more. Make your own face paint with natural coloring like beet juice or non-toxic food coloring. Check out this DIY recipe. If you plan to use store-bought makeup or nail polish, read the ingredient list and check EWG’s Skin Deep cosmetics database. 2. Stick to fabric or paper costumes, instead of disposable plastic ones. Many store-bought costumes are made of polyvinyl chloride (PVC or vinyl) or other plastics that can contain phthalates. For instance, testing by HealthyStuff.org in 2014 found that a toddler batman costume contained a high level of phthalates that were banned by the Consumer Product Safety Commission for use in children’s products. The mask that came with that same costume contained lead in its lining. Look to your local thrift store for old clothes that can inspire a brand new costume. Cardboard boxes make a fantastic costume base too. Check out these fun ideas. 3. Keep away from metal costume jewelry. Many tests by non-profits and government agencies have found lead and cadmium in cheap jewelry. Kids may stick jewelry in their mouths and some may accidentally ingest it. Stick to jewelry made of 100% gold or silver. 4. When trick-or-treating, avoid plastic pumpkins and themed plastic bags. HealthyStuff.org’s testing included Disney-themed trick-or-treat bags that contained high levels of bromine, an indication of brominated flame retardants. Use an old pillow case or grocery bag to collect candy. 5. Stick to decorations made of paper, fabric and pumpkins. Many plastic decorations may be made from PVC. Plus, HealthyStuff.org’s testing found that some Halloween light sets contained levels of bromine consistent with brominated flame retardants. 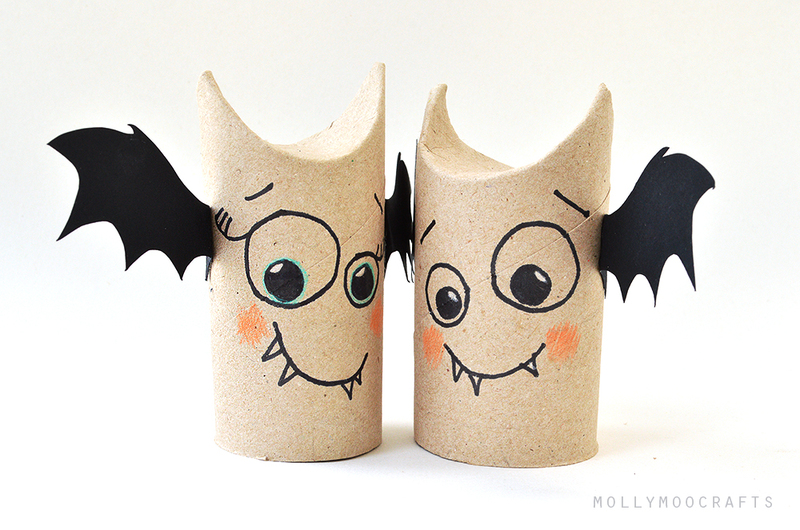 Try this spider cut-out idea or these bats made out of toilet paper rolls. I hope your whole family has a happy, healthy Halloween!